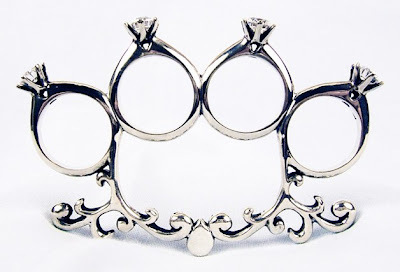 Thanks to guest blogger Jon we know about this "til death do we part knuckle dusters" by Kate Bauman. 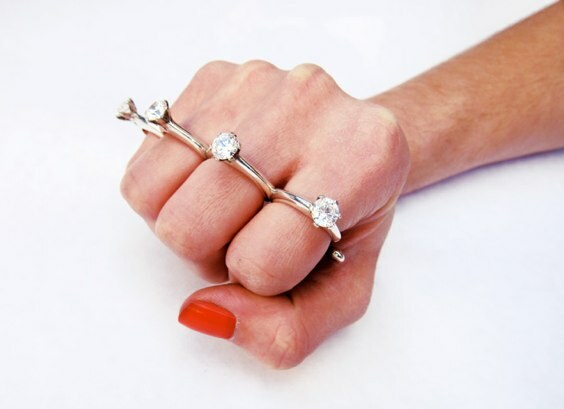 Originally designed and created as a one-of-a-kind statement piece in 2006, Kate Bauman is now offering my ‘Til Death Do Us Part ring as an unlimited edition. Mixing the styles of engagement rings and brass knuckles, much can be said about this ring, but I will let it speak for itself… Cast in sterling silver and set with four 1-carat cubic zirconia. Also available in brass. For custom metal or stone options, please contact her. This ring is made to order, and due to the high volume of recent interest, her current estimated production time is 2-3 weeks. Sizes available are: US size 7, US size 9, US size 11. All four of the rings are the same size, so please select a ring size that will fit the wearer’s largest finger, keeping in mind that the rings may fit a little loosely as brass knuckles or knuckle dusters would. It should go without saying, but I do not endorse or encourage any violent activity with this ring. It is intended solely as a unique statement piece in the form of jewelry. This is so dope! Absolutely love it.